Samir Nasri has revealed he has yet to put pen to paper on a new Arsenal contract despite reports he'd signed a new five year deal. The Frenchman's current agreement with the Gunners runs out next summer when the player could leave for nothing. The Gunners want to tie the player down with a new deal and had been negotiating with the player and his representative Jean-Pierre Bernes before Christmas. Negotiations ended without an agreement being reached although the club are confident the Frenchman will stay in north London. 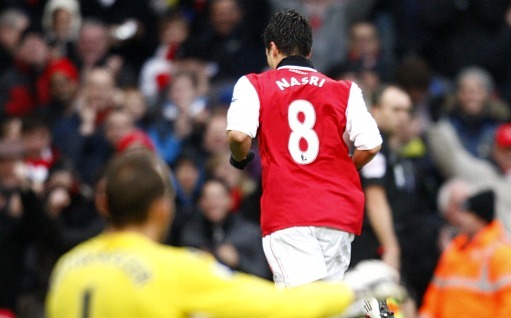 Last weekend The Sun reported Nasri had finally put pen to paper on a new five year deal with Arsenal. Not true says Nasri. "We have discussed it but, like the boss said, we will sort it out in the summer. At the moment what is happening on the pitch is the most important thing. "I want to stay here. I feel really good being here. The manager gives us a freedom to play, and everyone has shown confidence in me. If I am this player it is because of the manager and the people at this club."